I just finished making our Christmas postcards, and on the front I put the perfect little family picture that I shared on Thanksgiving. 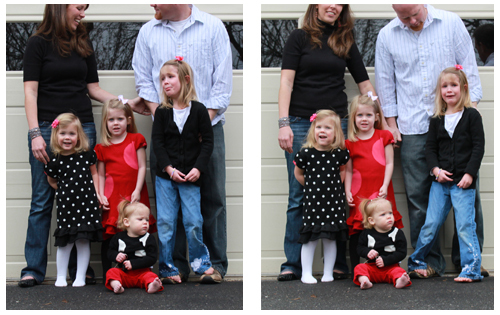 On the back, I decided to share a bit of our reality, which includes the two pictures above with our oldest daughter losing it during family picture taking, despite the bribe promise of M&Ms if she cooperated. But smiling or crying, she’s mine, and I wouldn’t have it any other way! Today we’re off to see Santa with some close friends, which will surely result in plenty more outtakes! Below are some of my favorite posts from the week. If you’re tired of the status quo, there are a lot of great posts here to make you stop and think. As always, check out what I’m reading to see the other posts that make me stop and think. You’ll find new posts all week long!